A citation identity is a list of an author's citees ranked by how frequently that author has cited them in publications covered by the Institute for Scientific Information. The same Dialog software that creates identities can simultaneously show the overall citation counts of citees, which indicate their reputations. 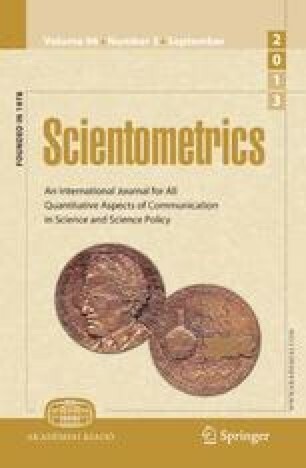 Using identities for 28 authors in several disciplines of science and scholarship, I show that the reputational counts of their citees always have an approximately log-normal distribution: citations to very famous names are roughly balanced by citations to obscure ones, and most citations go to authors of middling reputation. These results undercut claims by constructivists that the main function of citation is to marshal “big-name” support for arguments at the expense of crediting lesser-known figures. The results are better explained by Robert K. Merton's norm of universalism, which holds that citers are rewarding use of relevant intellectual property, than by the constructivists' particularism, which holds that citers are trying to persuade through manipulative rhetoric. A universalistic citation pattern appears even in Alan Sokal's famous hoax article, where some of his citing was deliberately particularistic. In fact, Sokal's basic adherence to universalism probably helped his hoax succeed, which suggests the strength of the Mertonian norm. In specimen cases, the constructivists themselves are shown as conforming to it.